Here’s a chance to point you to a great resource for all sorts of concealed carry and holster gear. The NRA Store offers a great selection of concealed carry clothing with integrated holsters, home and office holsters, gun security devices and of course those really nifty belt buckles. Of course the buckles don’t help with concealed carry, but they sure are cool. Prices are good and you help fund efforts to protect your gun rights. The Rapid Access Gun Magnet is just that — a magnet. It’s a hard plastic plate, about the size of a business card that has a round, rare-earth magnet built in. The Rapid Access Gun Magnet isn’t rare — the NRA Store has a plentiful supply, but apparently the “rare earth magnets” have a reputation for being extra strong and magnet-y. The magnet itself is a 1 ½ inch diameter circle that’s maybe ½ inch tall. It is completely contained in the plastic housing that also forms the back plate. The back plate has two grommet holes so you can mount it with screws, twist ties or glue to just about anything you like. Most any gun will stick to this magnet like crazy. It has no problem at all supporting a fully loaded, full size, steel 1911. That’s a heavy gun. As the magnet has a little height, you’ll find that the grip is positioned far enough away from whatever mounting surface you choose that you can get a proper hand hold on it when needed. Mount it under your desk. 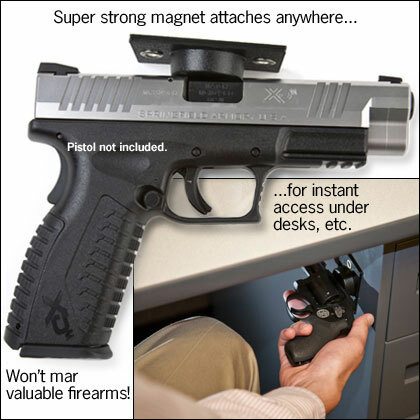 When you are going to sit for a while, unholster your gun and stick it on the magnet for comfort and easy access. Put one under your nightstand. While not a solution for child safety, it will keep your gun handy and accessible to you at night. Put one in your car. Check your local laws first. Some states want you to have the gun on your person, even with a concealed carry permit. Put one under the workbench if you’re a garage tinkerer. We bought this from the NRA Store a couple of years ago and it’s turned out to be exceptionally handy. As most any handgun, polymer construction or not, has steel in it we have yet to find a pistol or revolver that won’t work properly. Word of caution! This is not a safety device. There is no protection against unauthorized access, so consider your personal situation and environment carefully. Never rely on simply hiding a gun to keep it away from children. Learn more about gun holsters and concealed carry solutions for your body, home, office and car in our new book, The Insanely Practical Guide to Gun Holsters!